Home » Greenroom » Foodservice 2016 – Who Will Be Chef Of The Year? Foodservice 2016 – Who Will Be Chef Of The Year? Foodservice Australia are holding their annual event in Sydney from 22nd to 24th May 2016. 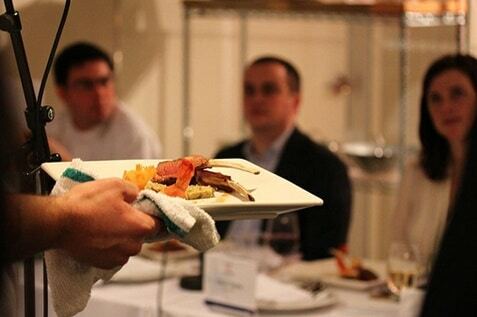 The yearly competition attracts contestants from restaurants and cafes all over Australia. Using a strict set of criteria, the judges choose a winner after 3 rounds that occur during the course of the event. Exciting! Each chef has 1 hour to plan, prepare and create the best dish from a mystery box of ingredients. From a stellar field of over 150 entries for Chef of the Year the judges have chosen 32 incredible finalists who will compete live at the show. The contestants include the best chefs from around Australia, including Matt Weller (Royal Canberra Golf), Anthony Unwin (Caversham House), Dane Poke (Bruce’s Cafe), Kurt Sonneman (Ziva). Last year’s Foodservice Awards was held at Melbourne’s historic Royal Exhibition Building. It was a 3-day show for food managers, hospitality business owners, suppliers, and chefs to showcase their bests. The highlight of the annual show is the “Chef of the Year” competition. Chef Chris Malone from Balthazar in Perth won the title and took home $6000 cash prize and a trophy. Alsco has always been a proud sponsor of this exciting annual event, even before. Alsco will be providing the best quality aprons and chef gears for the finalists. And will also be exhibiting products and services (like food and beverage linens, first aid kits and hygiene systems) to reach out to the hospitality industries. Visit our friendly team at Stand B19. Find out more from Foodservice Australia website. We look forward to congratulating the eventual winner. Do you want your restaurant’s chef and kitchen employees to look just as smart and professional as these year’s Chef of the Year finalists? Contact us and we’ll provide all your kitchen workwear needs – from chef jackets, waiter’s jackets to chef pants and aprons – we’ll take care of it all. Plus a customised logo, too!